Excellent grooming starts always starts with a firm understating of canine anatomy. It is the FOUNDATION of all grooming. Basic pattern lines are set based on the muscle and bone structure. Depending on how physically active a dog is, the muscle structure may be very prominent. It could be lurking under a layer of fat. It may also be poorly developed due to age or lack of physical activity. Nonetheless, those muscles are there. They will help you set symmetrical and correct pattern lines. The bones are there, too. Whether the dog is anatomically correct when compared to the breed standard is something else altogether. Understanding what a physically sound dog is will help you immensely. When you know the difference between good and bad structure, you’ll be able to hide many faults. When we combine all the layers of the dog – the bones, muscles, the skin, and the fur – we will be able to mold and shape the coat to highlight the dog’s best features and downplay the others. If the bone structure is a little less than perfect, you can use the hair to camouflage those defects. Before you begin grooming any dog, get your hands on them! Close your eyes. Feel the structure under the coat. Sink your fingers deep in the fur. Pay close attention to the muscle groups highlighted in color in these diagrams. Before you start grooming any dog, you need to familiarize yourself with the breed and understand its essence. The English Setter is a Sporting dog of great style. It should be physically fit and structurally sound to work long hours flushing game in the field. The general outline of the English Setter will be rectangular. The shoulder lay back and the angles of both the front and rear assemblies should allow for adequate reach and drive. The coat is silky, flat, and should lay close to the body. 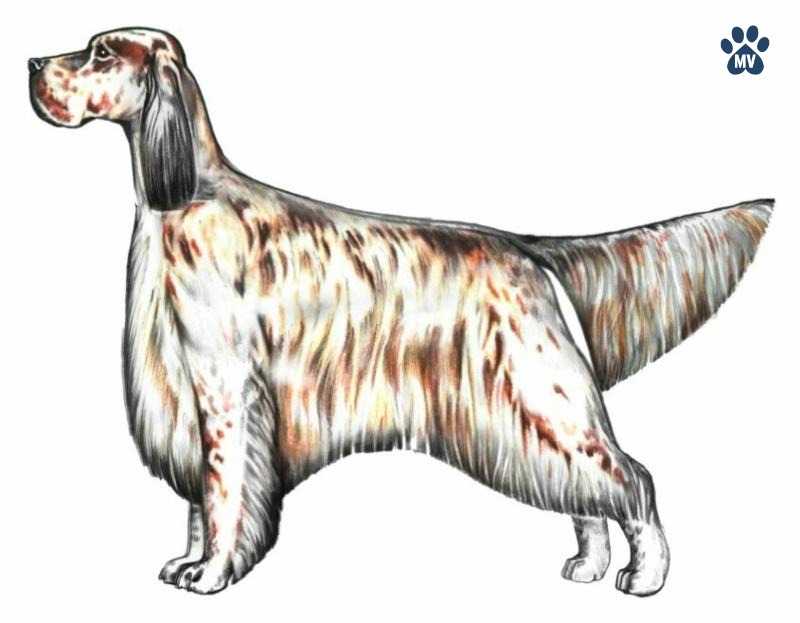 English Setters have longer feathering on the ears, chest, abdomen, underside of thighs, back of all legs, and on the tail. The longer coat should not be so long as to hide the true lines of the dogs, movement, or the function of field hunting. When it comes to grooming, let’s work around the dog using its anatomy as a reference. When done “correctly,” Setters are hand stripped for a very natural look. However, in pet grooming circles, it is common to see the pattern clipper-cut or styled using a combination of clipping and stripping to save time. Regardless of the method you chose, the anatomy reference points – or landmarks – will remain the same. Feel for the muscles at the sides of the neck to set the throat pattern line. A visual clue to this area is at the “frill” or cowlick line running down the sides of the neck. The throat area is directly below the jaw, inside the muscles running down the outside of the neck. The shape is generally a soft “U” shape. The lowest part of the “U” stops a few fingers above the prosternum bone. The jacket coat on the bulk of the body is shorter and lays flat on dog. Follow the natural lay of the coat when working this area. Use the turn of the muscle at the shoulder to set the jacket pattern on the body. The turn of the shoulder will also tell you the location of the elbow. This is the general location of where to start the pattern on the body, sweeping back and upwards towards the flank of the dog. 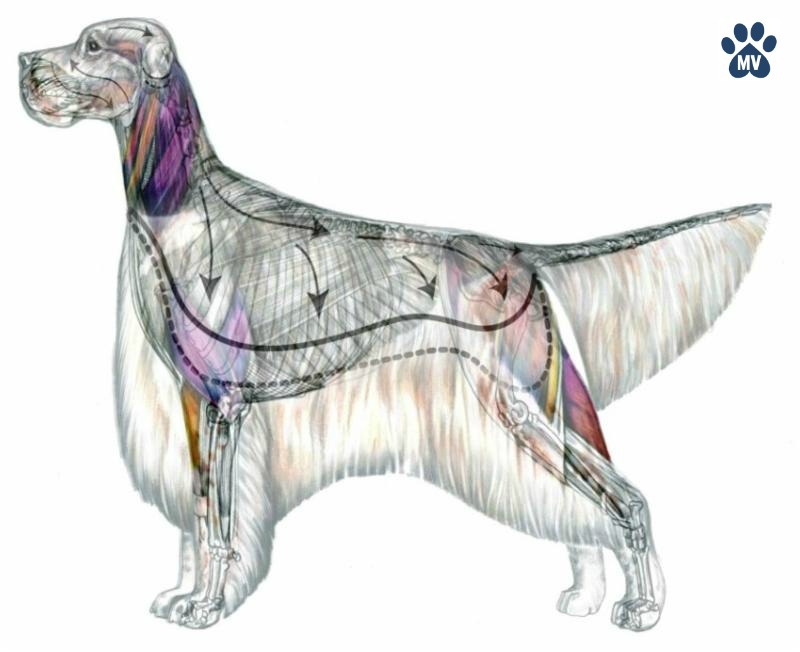 The turn of the ribs will help set the pattern line separating the dog’s body jacket which consists of much shorter coat, blending invisibly into the longer feathering found on the lower portion of the dog’s body. The undercarriage line creates a focal point for balance of the overall dog. The highest point of the graceful sweep will be directly under the last few ribs. Moving into the flank area, the thigh muscle should be exposed to help accentuate a physically fit and muscular dog. For balance, the tail should reach to the hock and be a triangular flag. There is a slight gap of fur on the underside of the tail at the base. This slight space separates the longer rear furnishings with the feathering on the tail. The top line maybe level or slightly sloping from the withers to the tail. The long graceful neck is well muscled and slightly arched. The lines of the skull are parallel with a well definite stop. Set well back and low, even with or below the level of the eye. All these areas are natural landmarks used as reference points on any breed. 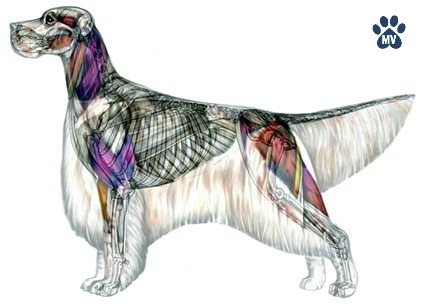 When you combine anatomy with the official breed standard for any purebred dog, you have knowledge. You can use this understanding to accentuate the proper structure of the English Setter. Always remember, all transition lines should be invisible. Ideally, the English Setter should look totally natural when finished – as if the coat simply grew that way. Combining the use of these anatomical landmarks and skillful technical skills, a talented pet stylist can easily create a symmetrical, stylish, and well-balanced trim on any dog – purebred or mixed breed. What breeds are a struggle for you? Let’s talk about it on our Facebook page with your Melissa Verplank family. Paragon School of Pet Grooming teaches the next generation of highly-skilled pet groomers and offers pet grooming services and products in Grand Rapids, Jenison, Hudsonville, Grandville, Georgetown Township, Wyoming, Byron Center, Allendale, Zeeland, and all of West Michigan.